Every time I find an amazing baby story I think that it can’t be topped, somehow another amazing baby comes along and shows us that they have what it takes to survive through ANYTHING! Jack Vellam, 13 months old, left hospital today after undergoing a life-saving treatment in which he was kept alive by an artificial heart for 120 days. He became the youngest patient to be connected to such a device for such a length of time as he recovered from myocarditis, an inflammation of the heart muscle. The boy, from Pitsford, Northamptonshire, was listed for a heart transplant after suffering a heart attack in March that left him so ill his mother initially agreed that his life support machine should be switched off. After being transferred to the Freeman hospital, in Newcastle, Jack was placed on an extracorporeal membrane oxygenation (ECMO) machine, which acts as a temporary heart and lungs for those awaiting transplant. But doctors decided to see if Jack could pull through without a transplant because around one in three children recover on their own. He was put on a device known as a Berlin heart – an external artificial heart, connected to his chest by four tubes, which pumps blood around the body. The device stayed on for 120 days before it was removed in a complex operation 15 days ago. The longest period a Berlin heart has been used at the hospital is 150 days, but the patient in that case eventually had a heart transplant. 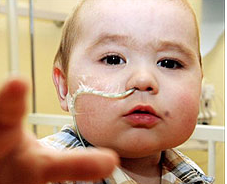 The consultant paediatric cardiologist Richard Kirk said: “He [Jack] would have died without the Berlin heart. You can realistically live on the ECMO life support machine he was using for four weeks – that would not have been enough time for a transplant or for him to recover from the myocarditis. I can’t imagine what these parents went through for the 4 months their child was being kept alive by a device that was outside of his body.